VDV Works Presents Uncle Ted's new guide to voice/data/video cabling. 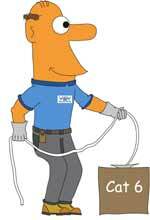 Uncle Ted was the mascot of Cable U's wiring training programs, focusing on Cat 3/5/5e/6 UTP cabling. He's Lennie Lightwave's Uncle and the expert of VDV wiring. Uncle Ted is now working with VDV Works, a company that provides training, training materials and web content on fiber optics, structured cabling, computer networking and telecommunications. Uncle Ted's Guide is an overview of what you need to know to get started in installing voice/data/video cabling, low voltage or communications wiring, structured cabling or whatever you call it. (Turns out the terminology is not standard, perhaps the only thing that isn't! ) After reading Uncle Ted's Guide, you might be interested in our textbook, Data, Voice and Video Cabling. We will attempt to cover some of the important issues (such as Cat 6 interoperability) in Uncle Ted's guide. And lifetime warranties? - well, we'll also get into that! We also have an online "virtual hands-on" explanation of the termination processes of Cat 3/5/5E/6 you should not miss. Now you can get a cabling/wiring self-study program from VDV Academy that starts with "Uncle Ted" and includes classroom and hands-on training. This booklet will hopefully get you started. If you want some real hands-on training, VDV Works can send you to trainers who give classes around the country or will come to your site. We're always creating new training material, links to information and cabling vendors to help you find what you need to know about cable installation, so keep checking back with us. Want a printed version of Uncle Ted? Click here for the PDF version (1.2 meg file). If you like "Uncle Ted's Guide" you'll love "Lennie Lightwave's Guide To Fiber Optics!" What do people say about "Uncle Ted's Guide"? "Uncle Ted's Guide to VDV (voice/data/video) Cabling" is a brilliant presentation of the standards and how everything fits together. (Don't be fooled by the title.) Be sure to click on the Jargon link for a comprehensive rundown. From TechRepublic, the IT website, discussing certification.